Worldwide efforts to make sodium-ion batteries just as functional as lithium-ion batteries have long since controlled sodium's tendency to explode, but not yet resolved how to prevent sodium-ions from "getting lost" during the first few times a battery charges and discharges. Now, Purdue University researchers made a sodium powder version that fixes this problem and holds a charge properly. 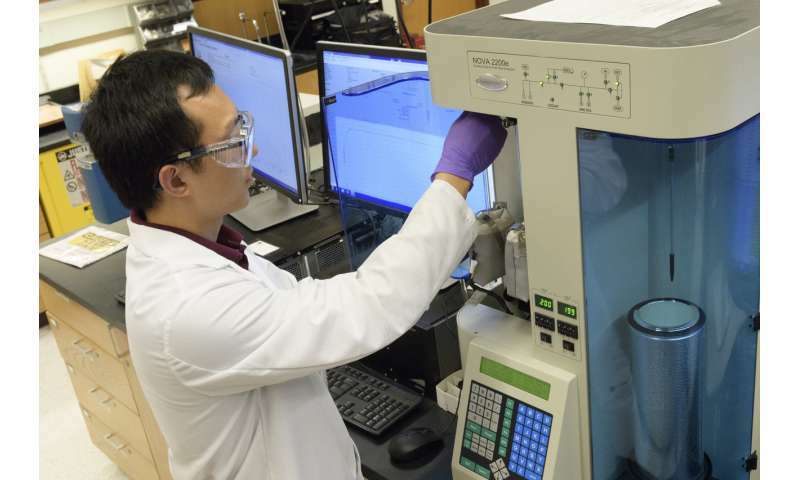 "Adding fabricated sodium powder during electrode processing requires only slight modifications to the battery production process," said Vilas Pol, Purdue associate professor of chemical engineering. "This is one potential way to progress sodium-ion battery technology to the industry." This work aligns with Purdue's giant leaps celebration, acknowledging the university's global advancements made in health, space, artificial intelligence and sustainability as part of Purdue's 150th anniversary. Those are the four themes of the yearlong celebration's Ideas Festival, designed to showcase Purdue as an intellectual center solving real-world issues. The problem is that sodium ions stick to the hard carbon end of a battery, called an anode, during the initial charging cycles and not travel over to the cathode end. The ions build up into a structure called a "solid electrolyte interface." "Normally the solid electrolyte interface is good because it protects carbon particles from a battery's acidic electrolyte, where electricity is conducted," Pol said. "But too much of the interface consumes the sodium ions that we need for charging the battery." Purdue researchers proposed using sodium as a powder, which provides the required amount of sodium for the solid electrolyte interface to protect carbon, but doesn't build up in a way that it consumes sodium ions. They minimized sodium's exposure to the moisture that would make it combust by making the sodium powder in a glovebox filled with the gas argon. To make the powder, they used an ultrasound—the same tool used for monitoring the development a fetus—to melt sodium chunks into a milky purple liquid. The liquid then cooled into a powder, and was suspended in a hexane solution to evenly disperse the powder particles. Apart from lithium being the third most abundant element in the universe, you mean? It's basically everywhere. Sure it's more expensive to extract it from elsewhere (e.g. seawater) but not prohibitively so. And, of course, lithium isn't used up in batteries. Once the market is saturated there's very little additional input needed. That said having sodium batteries is a really good idea for long term storage. Even though sodium ion batteries are less energy dense and also charge/discharge slower than lithium ion batteries those aren't issues for large grid storage. Here cost is king and that is where sodium excels. The author has a couple of basic facts wrong. Lithium as a charge carrier comprises less than 5% of a lithium ion cell. The difference in density between lithium and sodium is small, so battery mass would be far more dependent on the other components. Lithium is not rare. The vast majority of the world's lithium (87%) is extracted from the evaporation of brine. "lithium-ion batteries that is also known to turn purple and combust if exposed to water—even just water in the air." Turn purple? That's news to me. Have a source for those claims? There should not be any metallic lithium to react with air or water in a lithium ion cell. Lithium reacts with water vigorously but doesn't spontaneously combust if exposed to water. Lithium ion batteries can ignite because of a short circuit igniting the flammable ethyl carbonate electrolyte. It is the electrolyte that is flammable, not lithium compounds. The purple may stem from the cobalt content of most Li-ion batteries. Cobalt is more of an issue than lithium is (because of the way it's mined and also its relative scarcity). Fortunately methods exist to reduce the amount - and potentially even eliminate it - by replacing it with nickel. AFAIK the cobalt content is more stable in terms of combustion than nickel would be, but there seem to be promising additions of aluminium and manganese that counter that.